The Country Club Christian Church has been at this location since 1922, however the current sanctuary was dedicated in 1926. 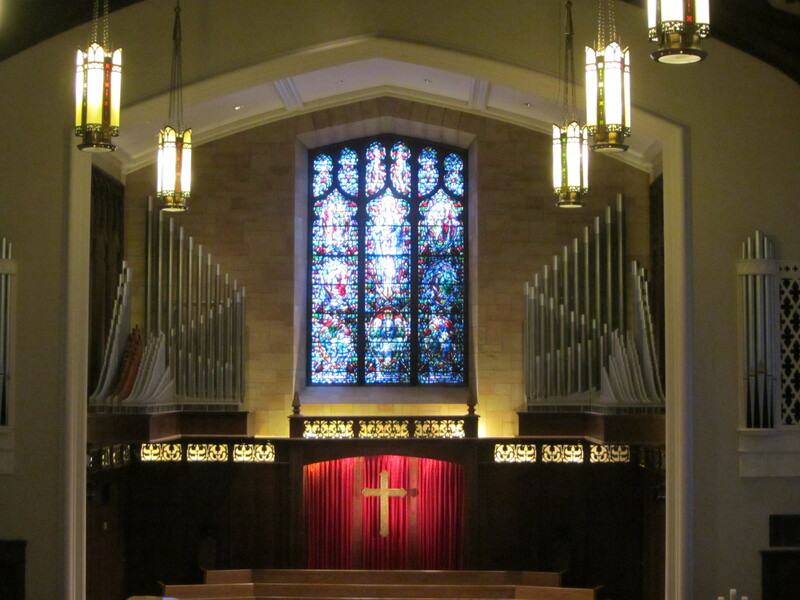 The following material about the windows in Country Club Christian is based on Biblical Lore in Sun-Lit Artistry: The beautiful windows of the Country Club Christian Church (1987). 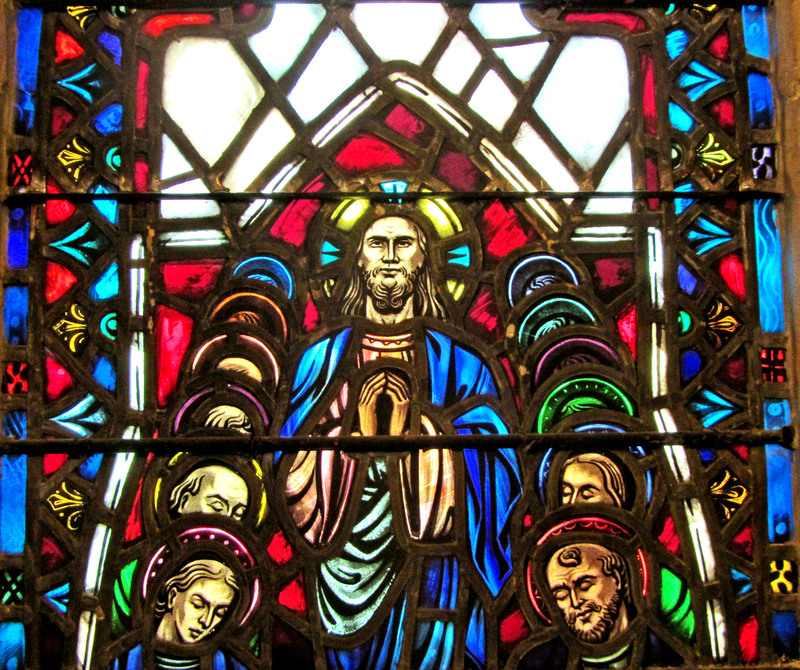 The windows in the main sanctuary of Country Christian Church were designed by Dr. Charles J. Connick (1875 – 1945) , one of the great stained glass artists of the twentieth century, and were the last to be designed by him. 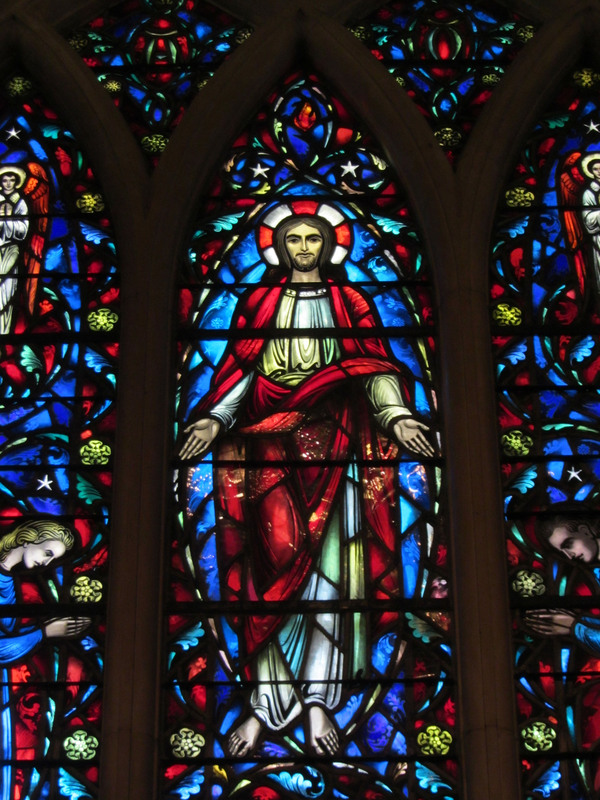 Connick described the symbolism of the colors in these windows as follows: In the 12th century pure red was the color of divine love, passionate devotion, self-sacrifice, courage, martyrdom and all of the warm impulses that belong to the greathearted everywhere. Blue in the middle Ages was a pure cobalt, shading from deep to light, approaching sapphire. Blue is the contemplative color–the color of Divine Wisdom. Blue symbolizes truth, constancy, eternity, Heaven itself, and steadfast loyalty. Green is the color of hope, springtime, youth, and victory. Violet, a combination of blue and red, symbolizes love, justice and truth and death , and is the color of royalty. Purple stands for pain, penitence, mystery. 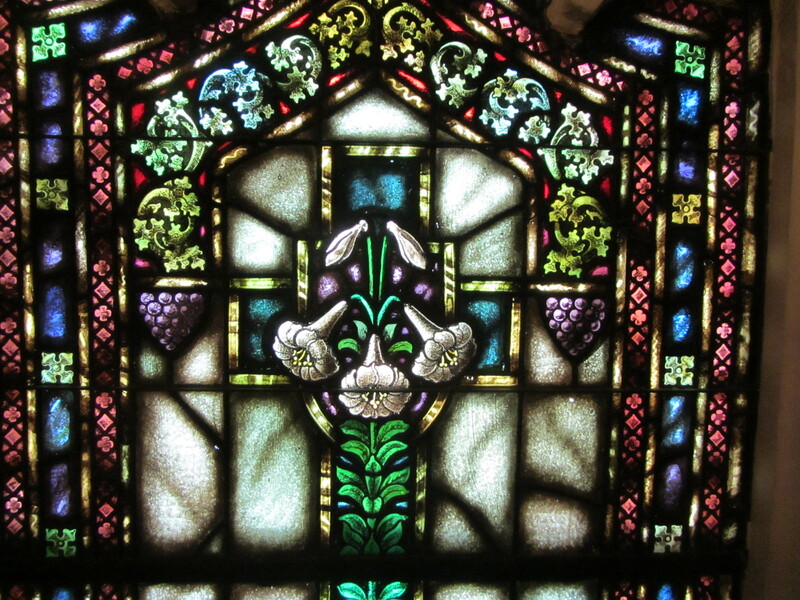 Connick noted that in ancient windows violet formed a beautiful background for white, which symbolized faith, the light of truth, or peace and serenity. 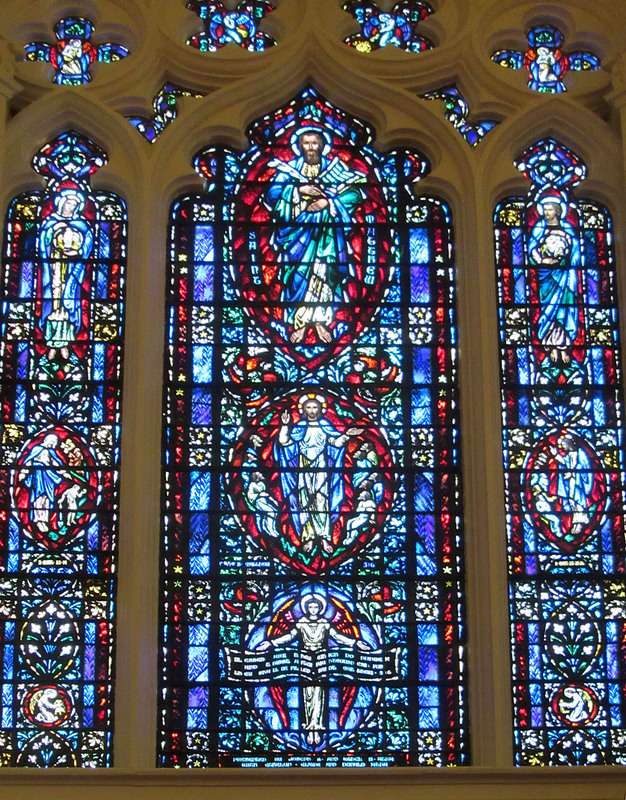 The windows in the sanctuary are quite large and complex in design and imagery. What follows is an illustrated discussion of the windows with some attention to smaller elements within the large windows themselves. We also discuss several other small window areas as well as the beautiful Combs Memorial Chapel. Th is window focuses on the theme of the Last Supper. 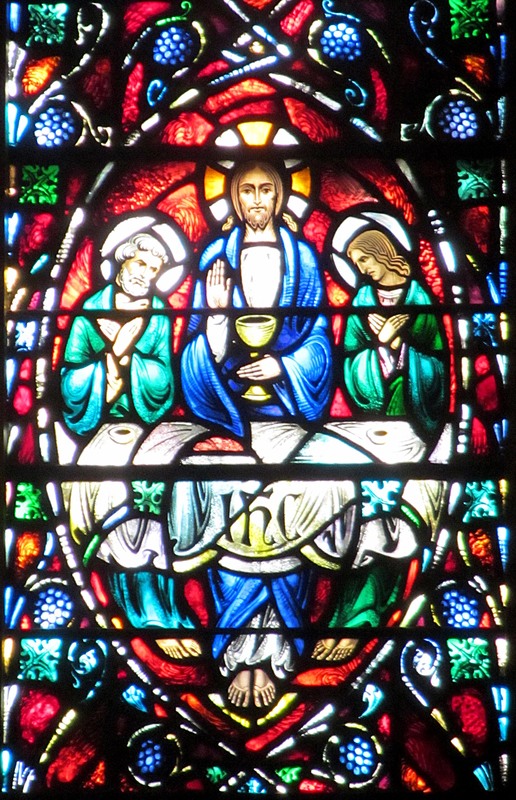 The central panel depicts Jesus as he blessed the bread, and shared it with his disciples. The four medalions surrounding Jesus illustrate Bible stories that relate to the last supper. Top Left shows Jesus feeding the five thousand. Top Right shows Jesus as he fed his disciples following his resurrection. 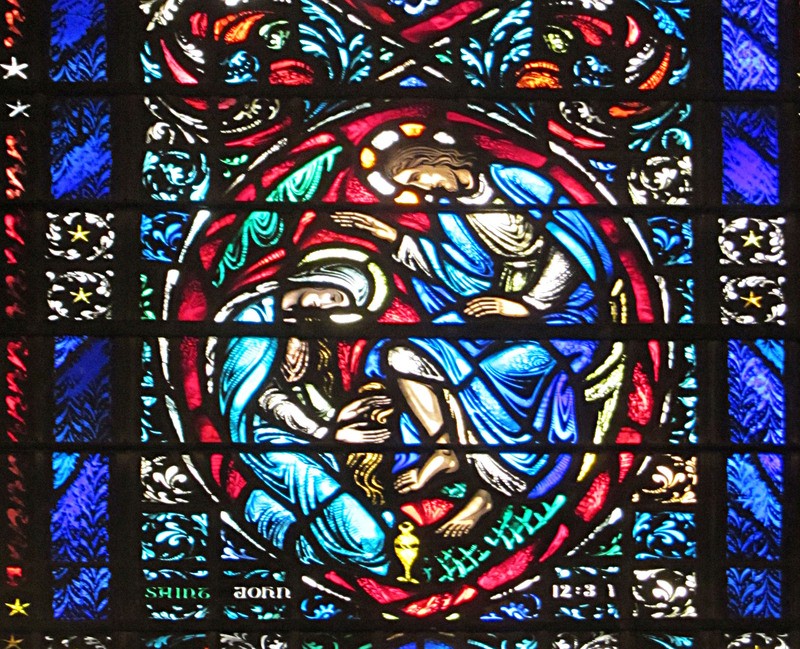 The middle medallions show Mary Magdelene washing Jesus’ feet with oil on the left, and Jesus washing his disciple’s feet on the right. The Last Supper extends across the three lower medallions. 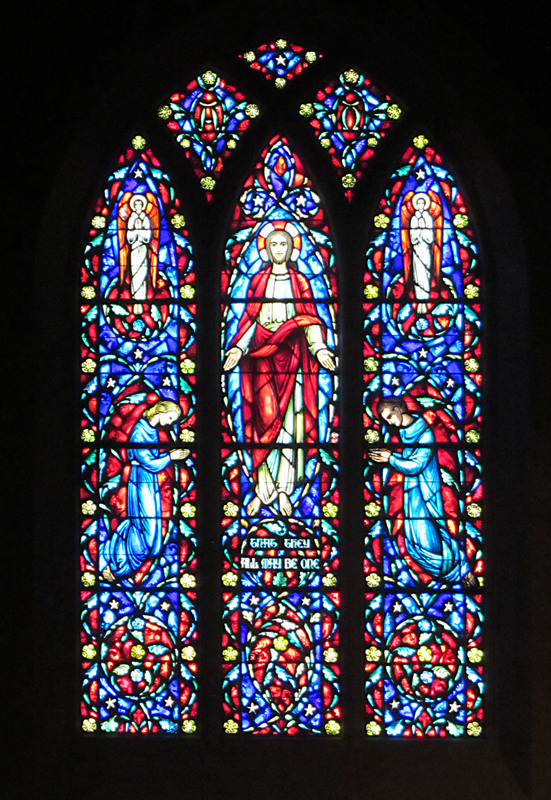 The Chancel window was installed (dedicated) in 1950. The window was presented in honor of Jesse R. Battenfield, his wife Margaret, and their two sons, Jesse R. Jr. and John Curry Battenfield. 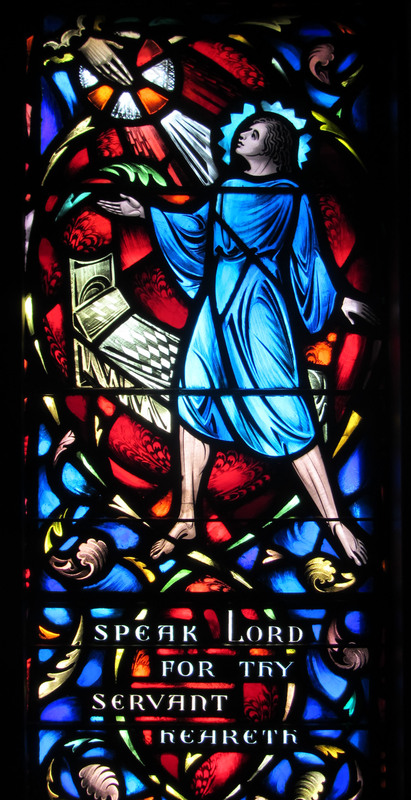 The central panel of the St. Luke’s Window shows St. Luke holding a book and pen, symbols of the evangelists. The book is inscribed with Luke 6:37 “Forgive and you shall be forgiven. 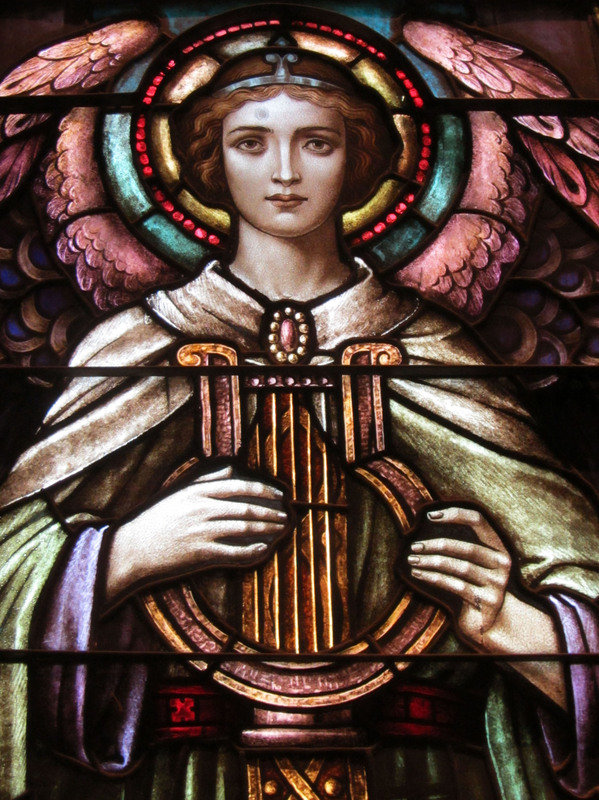 “On the lower part of his garment is a caduceus, the symbol of healing. The window was dedicated (installed) in 1947 in honor of Dr. George Hamilton Combs, the first minister of Country Club Christian Church. 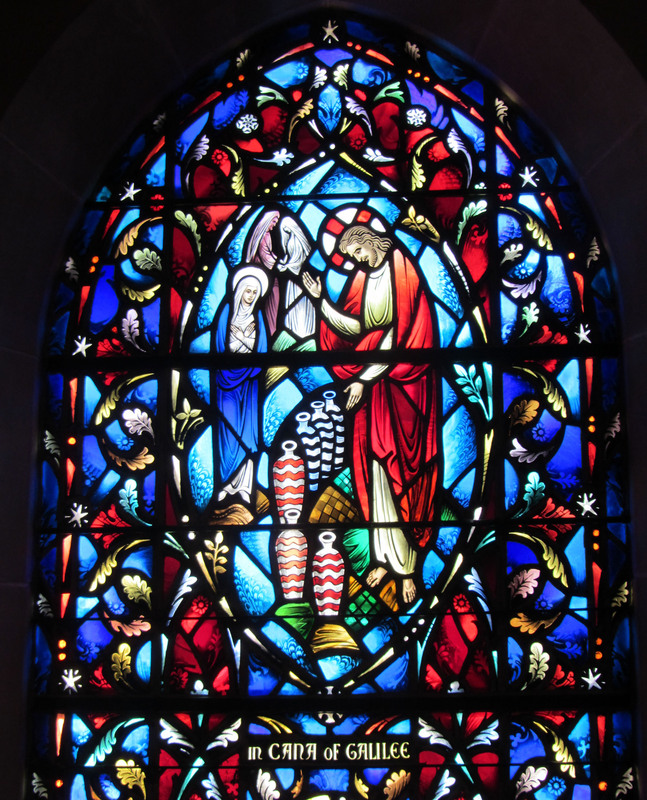 The St. Matthew’s Window was dedicated (installed) in 1947 and presented by Joseph S. and Ethel B. Atha, with Ethelyn, Elaine, and Donald Atha. Other stories recorded by St. Matthew are symbolized on either side of the central panel. Again the lower panels offer verses from the “Old Testament” prophets Micah and Hosea. 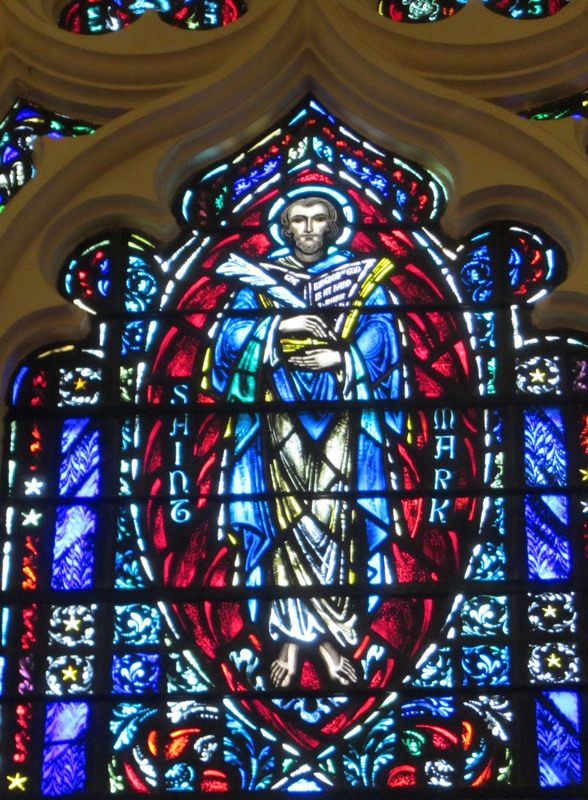 This window is dedicated to St, John, who emphasized the spiritual power and beauty of Christ. The central panel shows St. John holding a book and pen with the verse from John 14:6 “I am the way, the truth, and the life.” The medallion below depicts Christ’s discourse with Nicodemus. 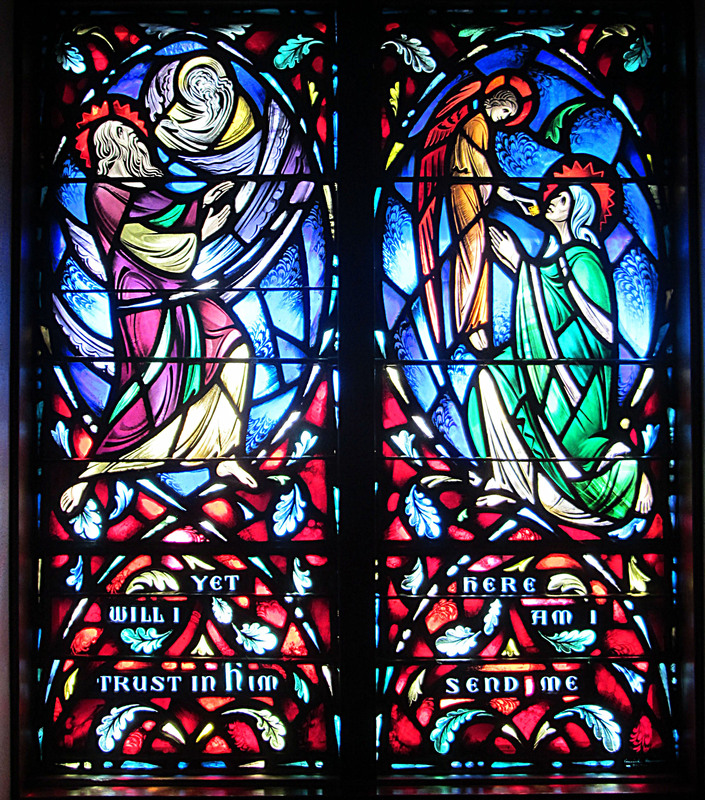 Below that an angel presents a verse from John 12:13 “While ye have light believe in the light that ye may be children of light.” Other parables recorded by St. John are symbolized on either side of the central panel. On the left side we see Christ as the Good Shepherd (John 10: 1-21) and also as the Light of the World (John 9:5). The middle medallions symbolize the lost sheep from John 10:16 and the healing of the man born blind from John 9:1-39. 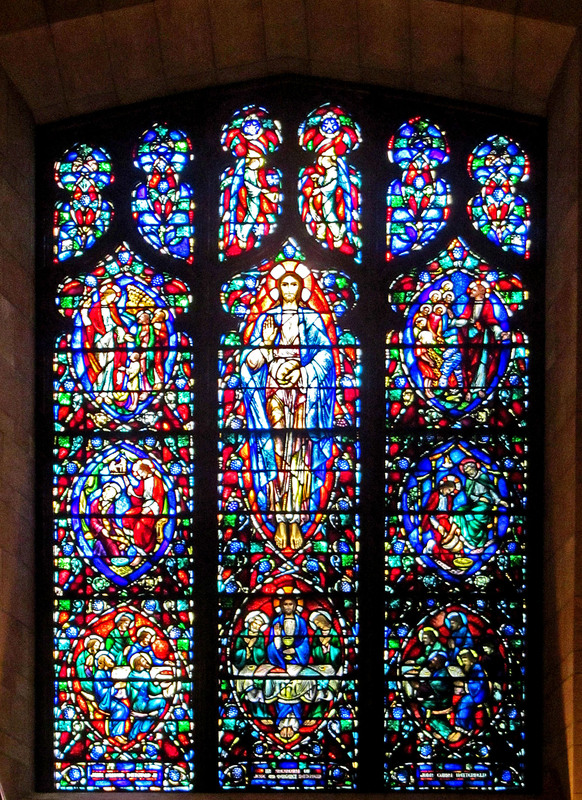 The St. John window was dedicated (installed) in 1947. It was presented by Arthur J. and Jesse Caulkins Daniel and their daughter Barbara. St. Mark dominates this window. He holds an open book with the verse “The kingdom of God is at hand” from Mark 1:15. 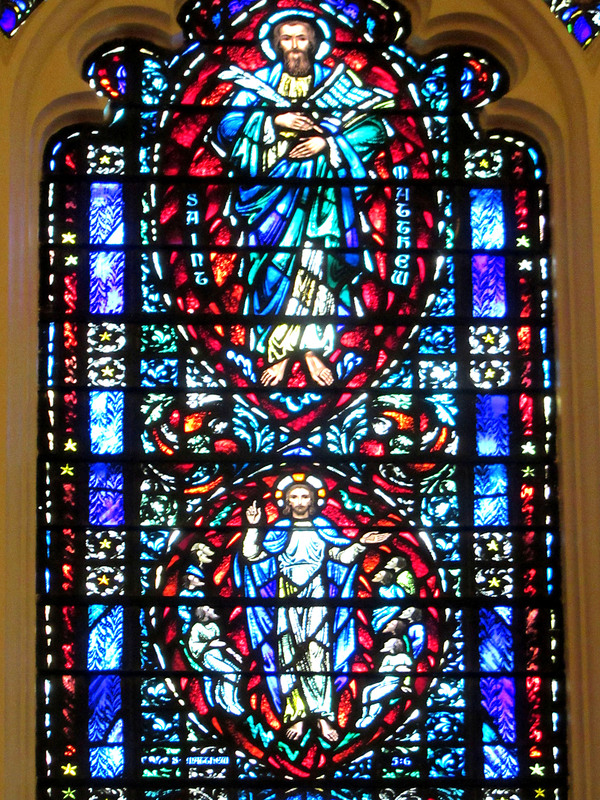 The St. Mark’s window was dedicated (installed) in 1947. The window was dedicated in honor of Junius Bertram Irving and Anna Elno Irving. 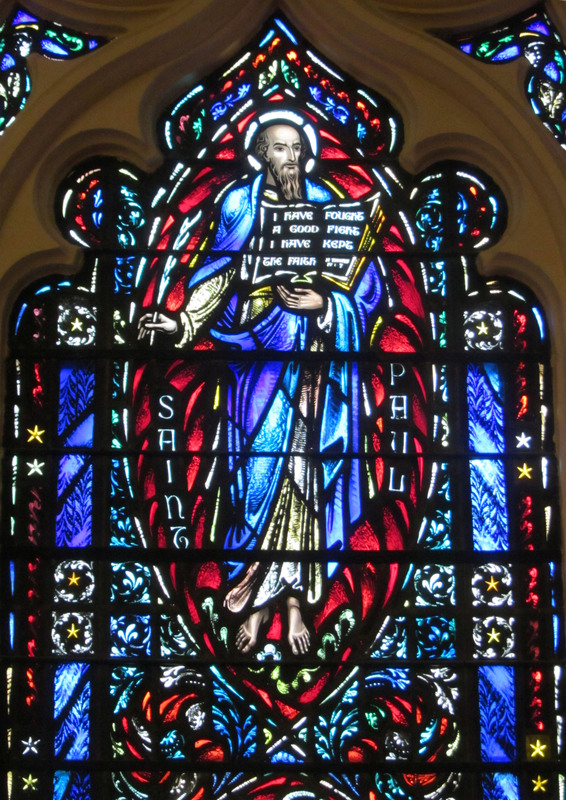 The central panel in this window shows St. Paul holding a book and pen with a verse from II Timothy 4:7 “I have fought a good fight. I have kept the faith.” The medallions flanking St. Paul show Barnabas on the left and Timothy on the right. The windows on either side of the central panel show Saul’s conversion on the left and the shipwreck on Paul’s voyage on the right. In the medallion below, Paul preaches to the Athenians as told in the 17th chapter of Acts. 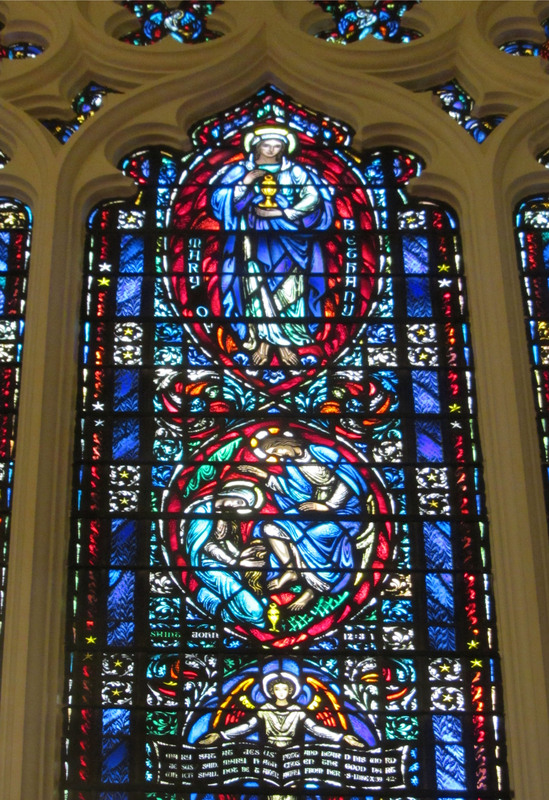 The St. Paul window was dedicated (installed ) in 1947. 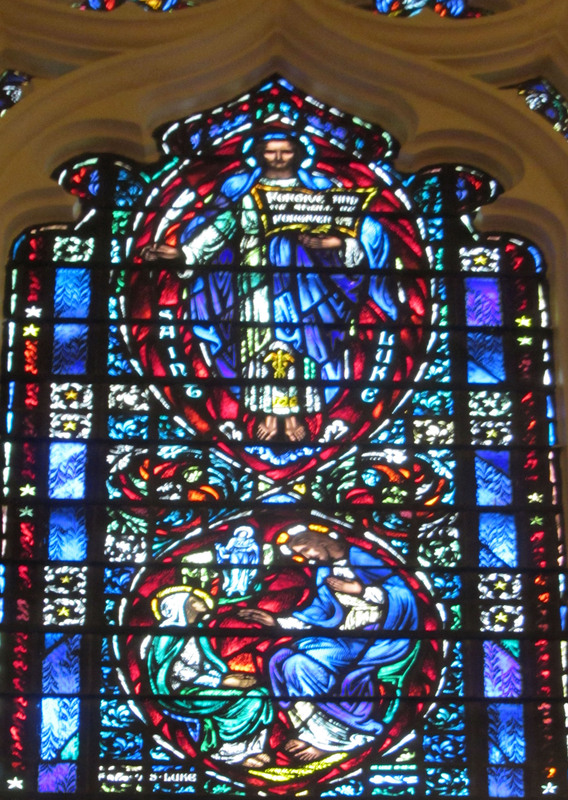 The window was presented in honor Orlando Victor Wilson and Ella Slaughter Wilson. 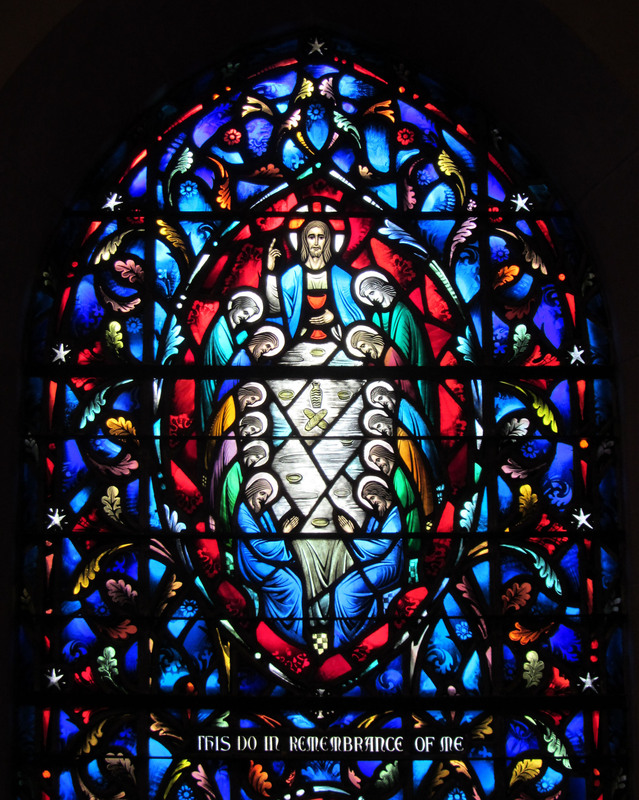 The dominant figure in this window is Martha of Bethany. Mary of Bethany holds a vase of sacred ointment at the top of the central panel. Below that Mary anoints the feet of Jesus. 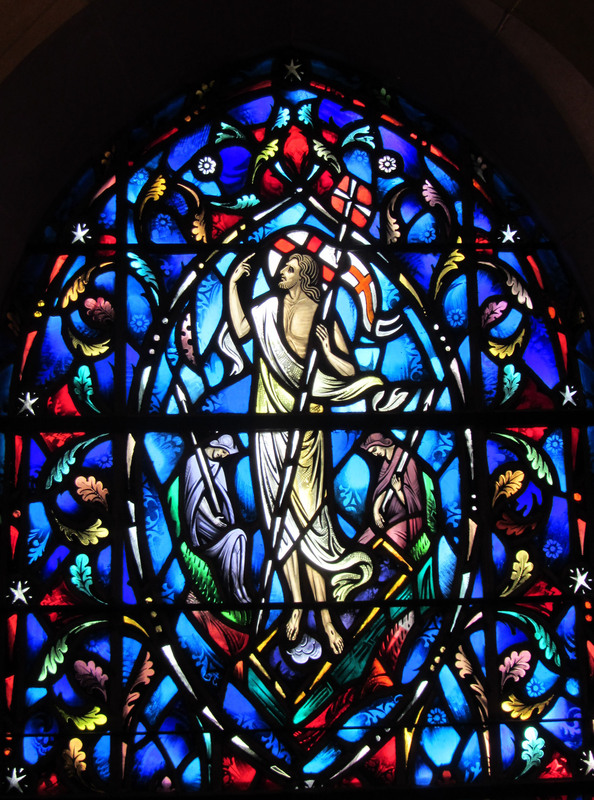 Unlike the other windows in the main sanctuary of Country Club Christian, this window was designed and fabricated by the Jacoby Art Glass Company of St Louis, Missouri. 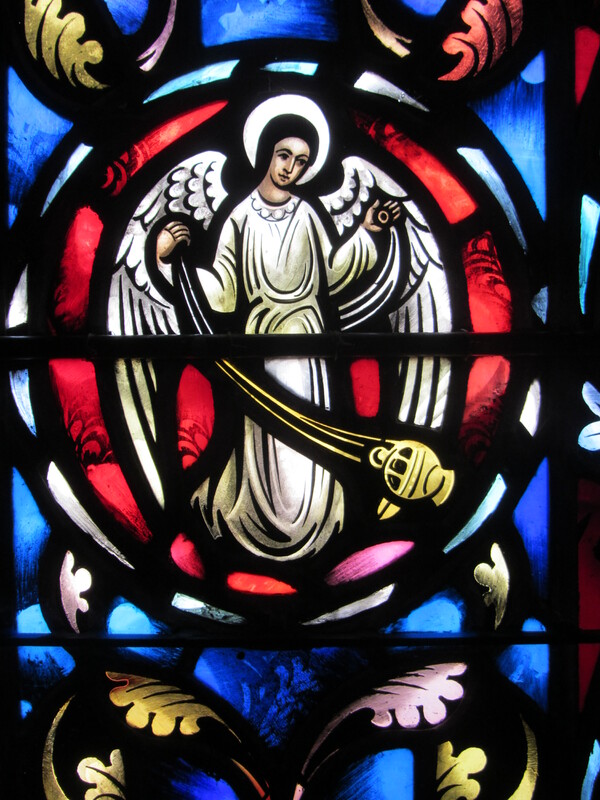 The window was designed by Charles J. Andrew of Kansas City. 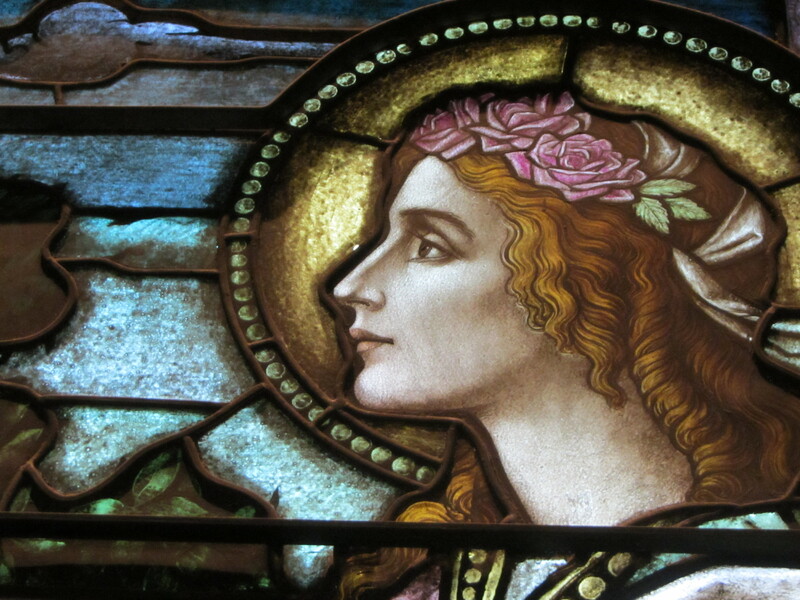 Installed in 1924, the St. Cecilia window was the first stained glass window installed in the sanctuary. The St,. Cecilia window was presented by Mrs. Jennie L. Sweet in honor of her daughter Mrs. Athelia Sweet Berger. Three windows at the south entry to the Sanctuary were designed by the Willet Studios and dedicated in 1958. 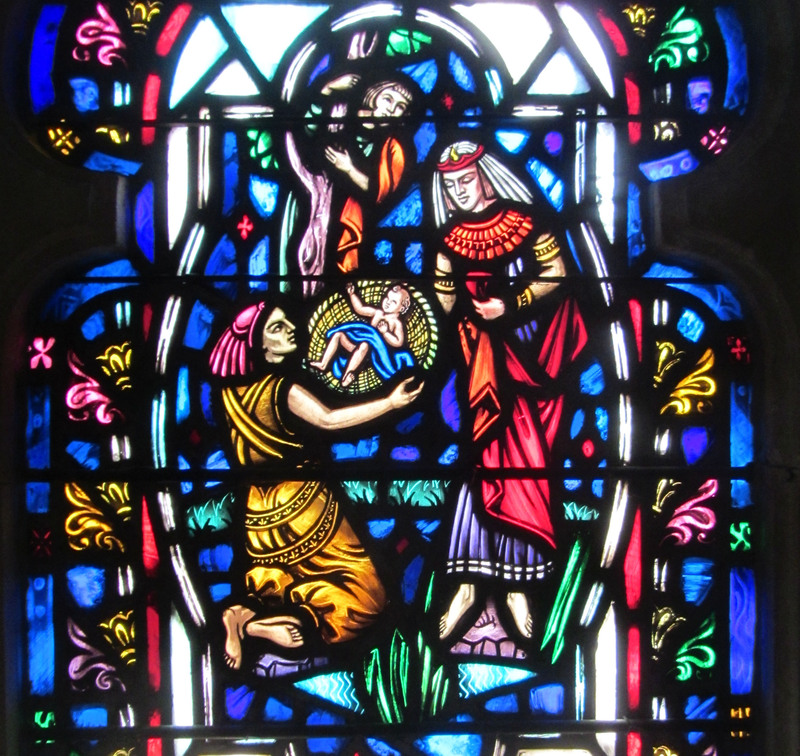 The first window, given by Mr. and Mrs. Milburn Hobson in honor of B. L. and Cora Wheatley, portrays Hannah bringing her son Samuel to Eli the priest at the temple. 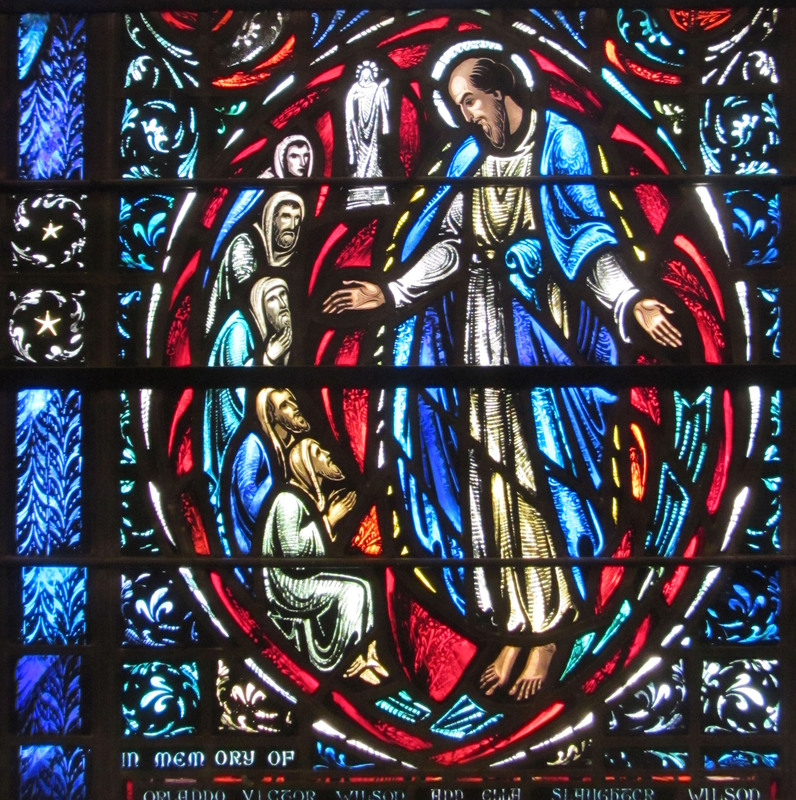 The second window, given in memory of Mr. Robert Lee Mehornay, depicts Jesus teaching the disciples to pray. 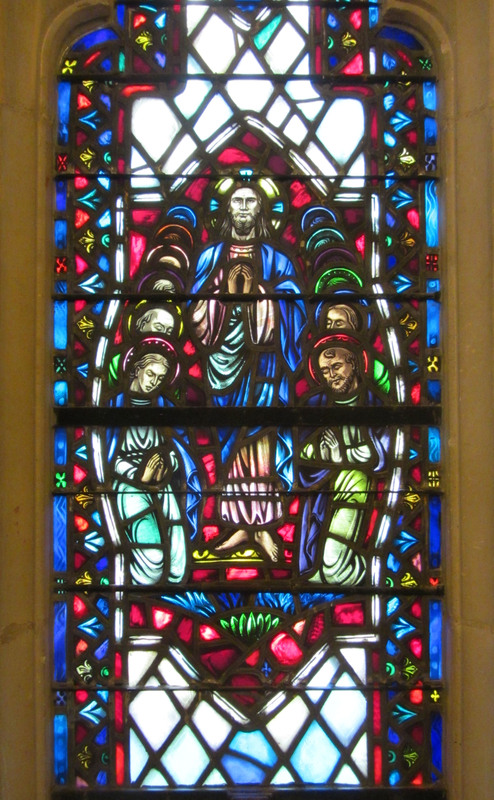 The third window, given in honor of Mr. and Mrs. Langston Bacon, by their children, Mrs. Charles E. Waldron Sr., Mrs. Elizabeth B. Ruddy, Mrs. S. W. Black Sr., and Langston M. Bacon, shows Mary and Joseph bringing young Jesus to the temple for the first time. Windows on the Stairway were also designed by the Willet company. Below this central is an image of the bag of money and the 30 pieces of silver which was Judas’ compensation for his betrayal. The window at the south at the stairway landing, given in memory of C. Norman Sears, by his wife, Linnie B. Sears; son, Charles N. Sears; and daughters, Louise Sears Turner and Dorothy Sears Crebo, shows a woman giving three children a drink, symbolizing acts of Christian mercy. The three head windows on the south stairway were also designed by the Willet company. These windows were given in memory of Mrs. Jennie L. Sweet, (1869-1956) a charter member of the Country Club Christian Church. The left window shows Miriam watching as her baby brother, Moses, is discovered floating in the bulrushes by Pharaoh’s daughter. 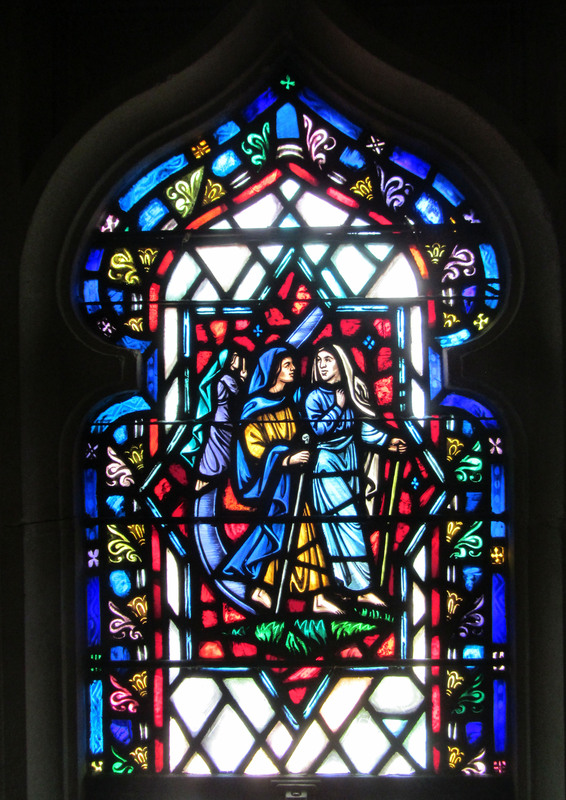 The center window shows Ruth accompanying her mother-in-law, Naomi, away from her land of Moab back to Naomi’s land of Judah. 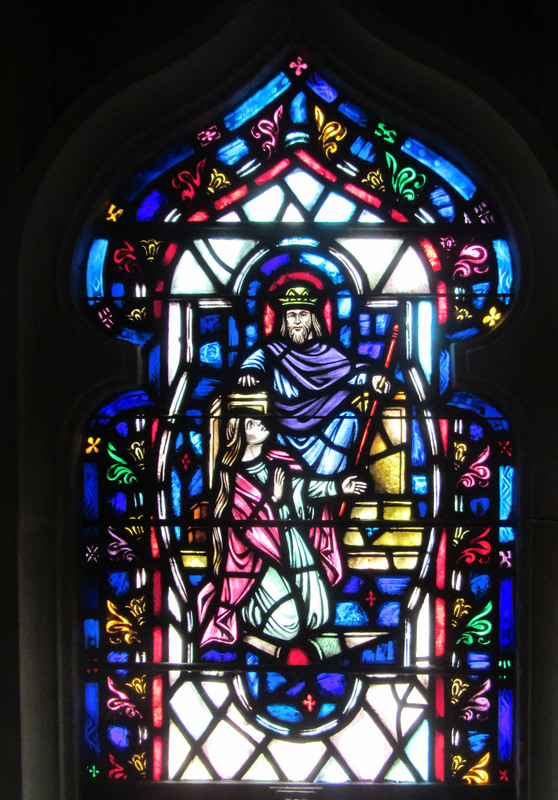 The right window depicts Esther pleading for her people at the feet of King Ahasuerus. The George Hamilton Combs Memorial Chapel was dedicated in 1962. The architect was Edward W. Tanner. 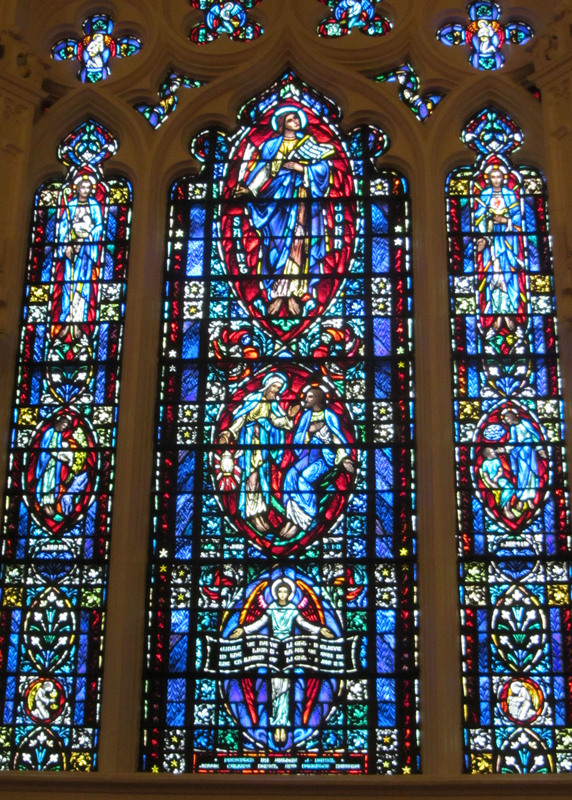 The chapel windows were designed by Dr. Charles J. Connick, as were the windows in the main sanctuary. 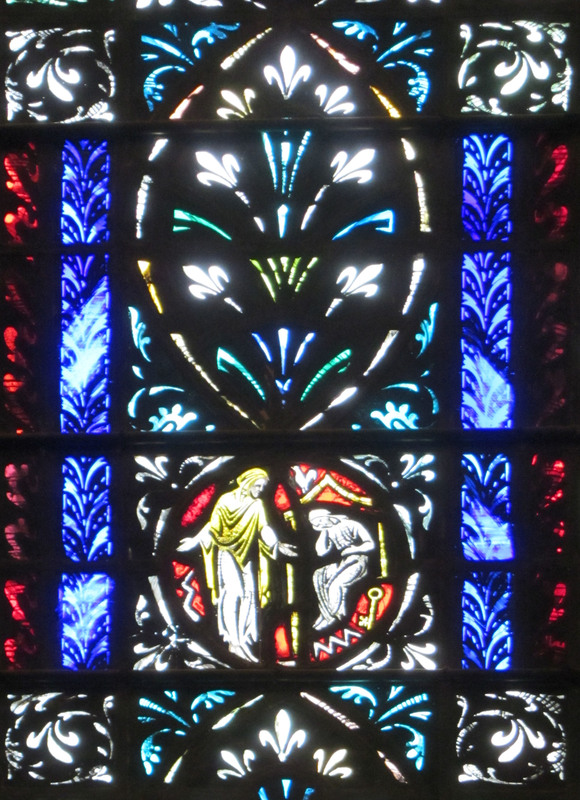 In this window, Christ is flanked by two angels kneeling in prayer. The verse displayed ” “that they may all be one” is from John 17:21. 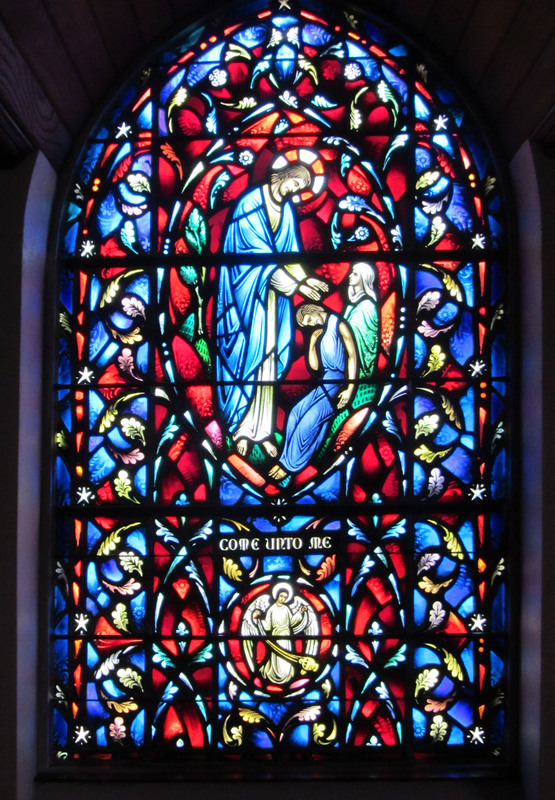 The Combs Chapel Alter Window was given by Mrs. Robert L. Sweet and family in honor of Mr. Robert Lockwood Sweet. 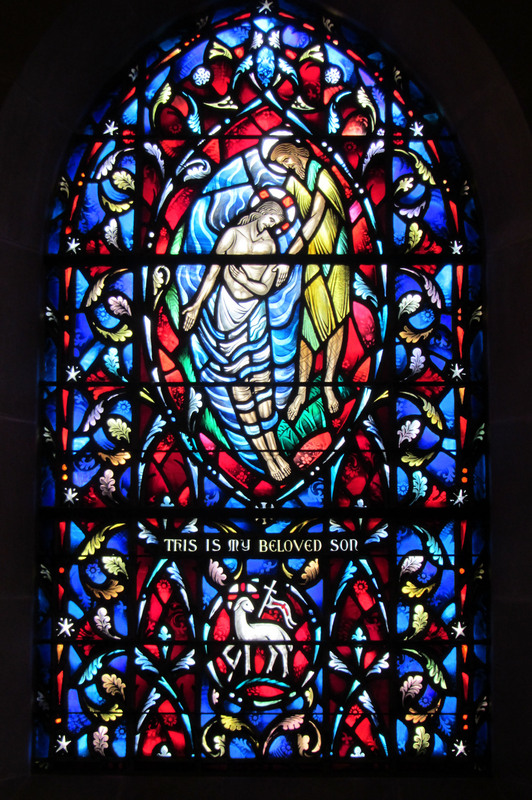 The right window on the north side of the chapel tells the story of Jesus’ baptism by John the Baptist. The left window on the north side of the chapel tells the story of Jesus at the wedding at Cana from John 2:1-11. 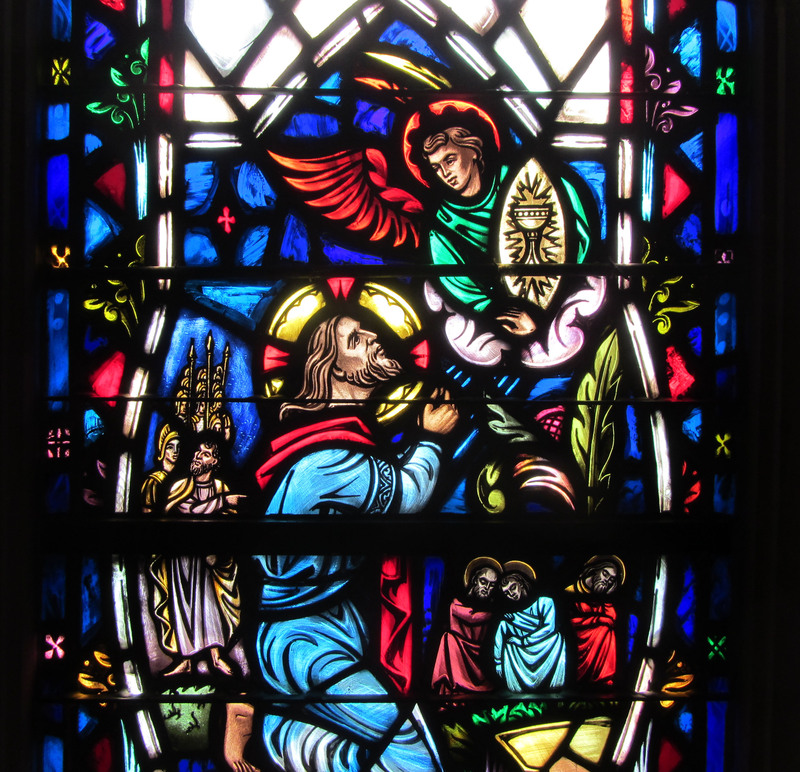 The right window on the south side of the Chapel depicts Christ as the resurrection and the life from John 11:23-26. 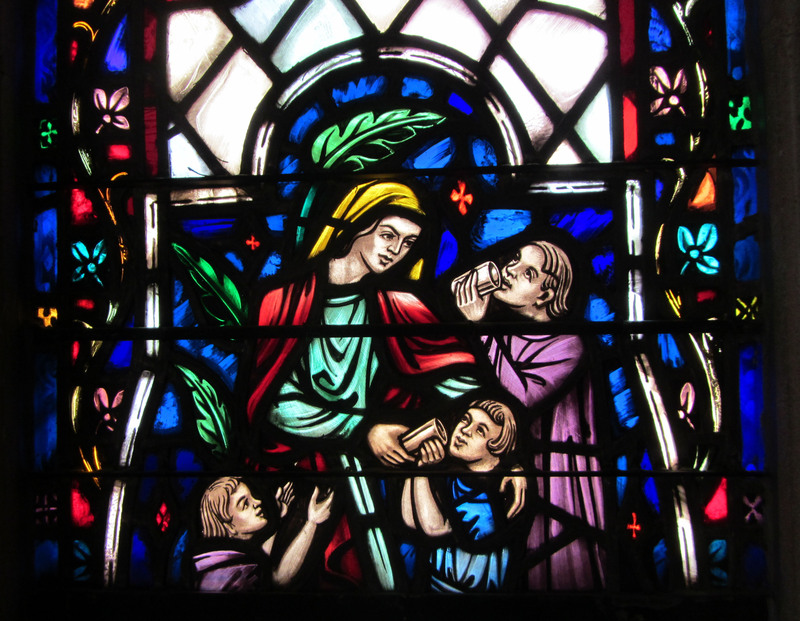 This window, on the north side of the chapel narthex depicts Jesus helping the unfortunates and giving rest to the weary from Matthew 11:28. The window on the left shows Moses as he encountered the burning bush and heard the voice of God from Exodus 3:1-5. On the right, the hand of God is reaching down to Samuel from I Samuel 3:1-10. The panel on the left shows Job with God in the whirlwind from Job 13:15. On the right, we see Isaiah and an angel from Isaiah 6:9. 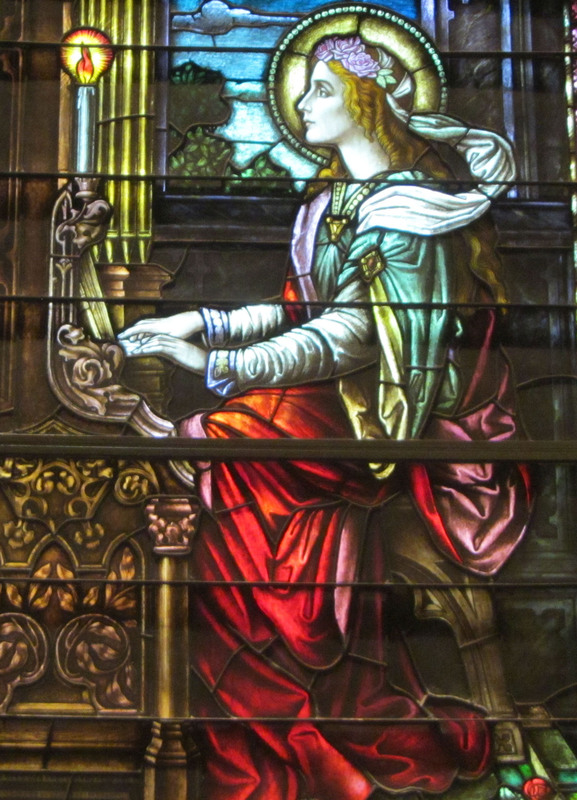 This window was also designed by Charles J. Connick. In the center is the Greek Cross suggesting the Church of Christ. The eight petals each symbolize a specific aspect of Christianity. Starting at the top, the lamp, because of the light it sheds, stands for wisdom and piety. The anchor is a symbol of hope and steadfastness. The lily symbolizes purity and the crown Christian victory over sin and death. The sweet fruit of the cherry symbolizes the sweetness of character derived from good works. The cherry on Christ’s hand suggests the delights of the blessed. The petal with the sword is a tribute to the saints who suffered martyrdom at the sword’s edge. The lamb symbolizes victory over death won by Christ’s death. Finally, the dove, a symbol of purity and peace, comes from John 1:32 when Christ was baptized and saw the spirit of God descending from heaven like a dove. 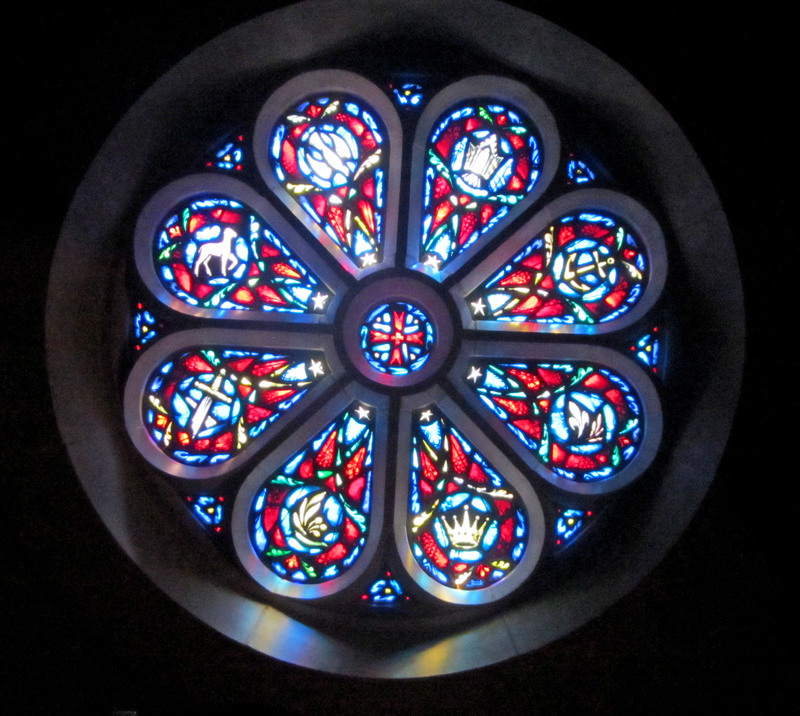 The Rose Window was given by Mr. and Mrs. Arthur J. Daniel in honor of their parents. .